At an altitude ranging from 4,000 to 5,000 feet. 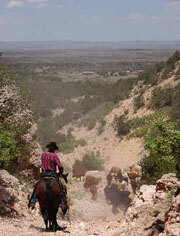 The JX Ranch Headquarters sits in the shadow of the Caprock, a steep escarpment that runs through the ranch. About 160 Texas Longhorn cows and their Charolais-cross calves graze on this ranch. Every morning we ride out to check on the cattle, watch for new calves being born, or move them to new pastures when scheduled. Our USDA Certified Natural Angus Beef is 100% hormone, antibiotic and preservative free. Proudly, Branch Ranch Natural Beef is one of the few "Verified Natural" beef sources in the U.S. that is pasture raised, finished, processed and distributed by a single entity. Therefore every product that we sell is Source & Age Verified, and can be traced back to our Field Family Ranch, which straddles the border of West Texas and Southeast New Mexico. Whether you call it pick-your-own, PYO or U-pick, it's easy to find a farm in your area! Find locally grown produce anywhere in the country! Locate farmers markets, farm stands. Farmer-owned milk marketing cooperative focused on securing markets and bringing value to our members beyond a milk check. Conducts public-policy outreach on behalf of its 43 affiliated state associations, enhancing opportunities for the success of U.S. pork producers and other industry stakeholders. The Foundation supports educational and research activities that will ensure a wholesome and economical supply of beef to the public. Shepherd's Lamb: home to the best certified organic grass-fed lamb, yarns, and wool products from the mountains of northern New Mexico. JX Ranch Natural beef: We raise and sell Grass Fed Beef that is all natural. It is dry aged lean beef, born and raised free range on our sustainable family ranch in New Mexico. We can ship to you. Jerky By Art: Shop for the best homemade beef jerky made from USDA meats. Choose from over 20 varieties and flavors. Albuquerque, New Mexico. Pollo Real: has been New Mexico's premier pastured poultry producers for the past sixteen years. Featuring Gourmet French Label Rouge Chicken, Heritage Turkeys, and Farm Fresh Eggs. Promote your "New Mexico Livestock " - "Meat Business"
Promote your business with the United States leading online link site for farming. Get your business noticed with a free listing on tawty.com and benefit from the power of this website. John Brooks Supermart has been serving New Mexico since 1978. We specialize in the freshest meats, produce and dairy in the state and our staff offers quality and reliable service you can count on. Delivers the highest quality natural meats to the gourmet restaurants of Santa Fe and Northern New Mexico. We strive to maintain the highest health and humane standards in raising and preparing animals for market. We also cater to the retail market where our meats are sold directly to consumers. Home of the finest Ostrich, Emu and Rheas in New Mexico and the Southwest. In operation since 1980, the Ranch is well established in the Ratite Industry. We take pride in the quality of our breeder birds and offer a full line of Ostrich products. Find the U.S most popular meat organisations for beef, pork and lamb and less popular meat like bison, buffalo, rabbit. Poultry boards and govern bodies for chicken, turkey, duck, goose, quail, pheasant, pigeon, guinea fowl, pea fowl, ostrich, emu and rhea.